Life does not exist without the intestine. The source of the heart and mind exists in what makes the intestine move, searching for food or reproduction. Higher living animals have been borne from the intestine and sustained by it. This suggests that the heart and mind is located in the internal organs. The character of a patient who underwent the simultaneous transplant of the heart and lungs, has been replaced by that of the donor. 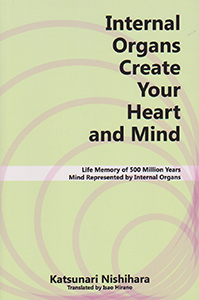 The author thinks that the heart and mind dwells in the intestine such as the heart, the reproductive organ and the face. He, a world-famous doctor for the development of artificial organs, has searched for the origin of the heart and mind by elucidation of the evolution of the vertebrate in his own way.